The beautifully crystallized silver minerals from, according to my information, San Jose mine (San José del Progreso, Oaxaca, México) constitutes a recent and very interesting novelty for those interested in specimen and topographical mineralogy and mineral collection. Here, we will summarize our mineralogical observations on some well crystallized samples. 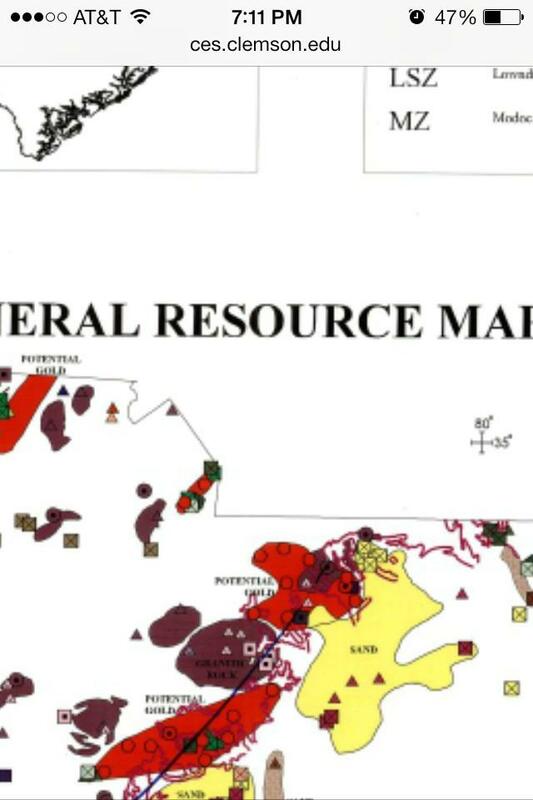 More analysis and specimens will be necessary to complete our knowledge of the minerals from this locality and I will complete this thread with available data. The San Jose mine, located in the San José del Progreso municipality, benefits an hydrothermal deposit constituted by Ag-Au bearing quartz (carbonate) veins that cut andesite volcanic rocks. The postulated metallogenic model suggest that the mineralized veins in San Jose del Progreso and San Jeronimo Taviche is an epithermal Ag-Au mineralization, associated to the intense hydrothermal and hot spring activity in the margins of a collapsed caldera subsequent to an intense subaerial volcanism episode during late Cretaceous or Cretaceous-Tertiary boundary. The mineralization is classified as “low sulfidation” Ag-Au vein mineralization, based on mineralogical features, as dominance of silver sulfosalts and absence of enargite. The mineralization is mainly fine grained and disseminated pyrite, with acanthite, silver sulfosalts, sphalerite and galena, and hosted by quartz with variable carbonate or disseminated in hydrothermal breccia. The veins could exceed 10 meters thickness and the presence of vugs and drusy cavities is common, favoring the formation of well developed crystals. We studied some silver minerals from the San Jose district, mainly using Raman spectroscopy and, in some cases, elemental analysis by X-ray emission spectroscopies. 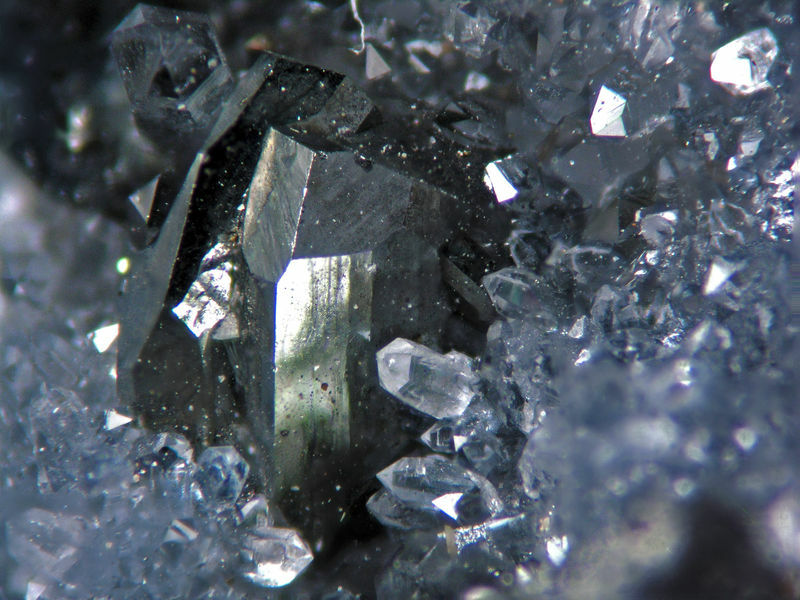 Due to the high silver content, the mineral could be labelled as Freibergite. Anyway, individualized analysis of specimens is mandatory if one wants to write the correct label. 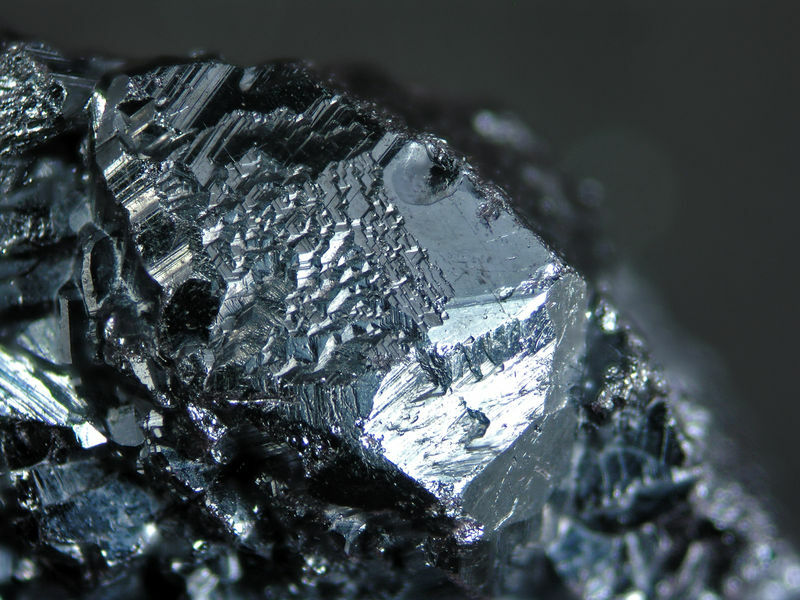 The Tennantite, the As dominant analog of Tetrahedrite, is present in the form of steel-gray to iron-gray tetrahedral and modified tetrahedral crystals. 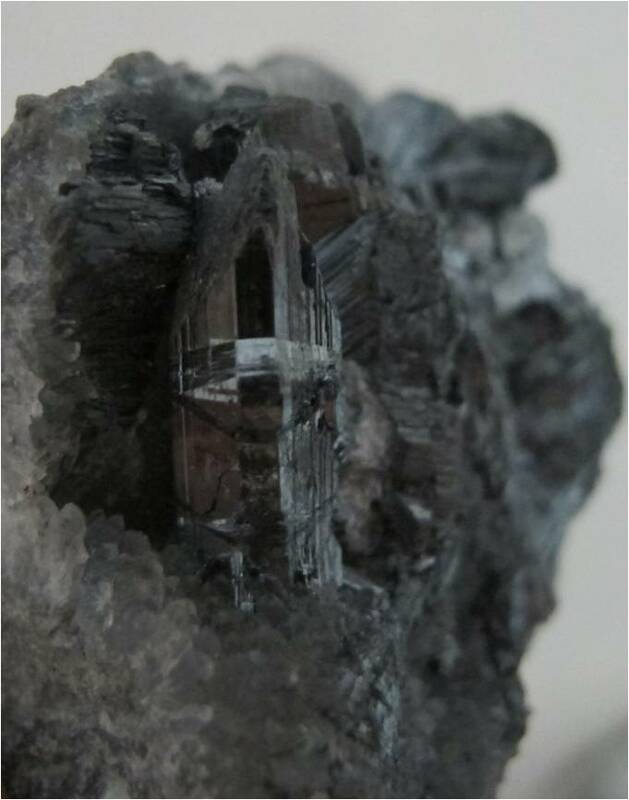 In the samples studied, Tennantite does not appear accompanied by Pyrargyrite or Miargyrite, a clue to its visual identification. Despite the presence of Tennantite, we did not observed the arsenic end of this series, Proustite, in the specimens studied. 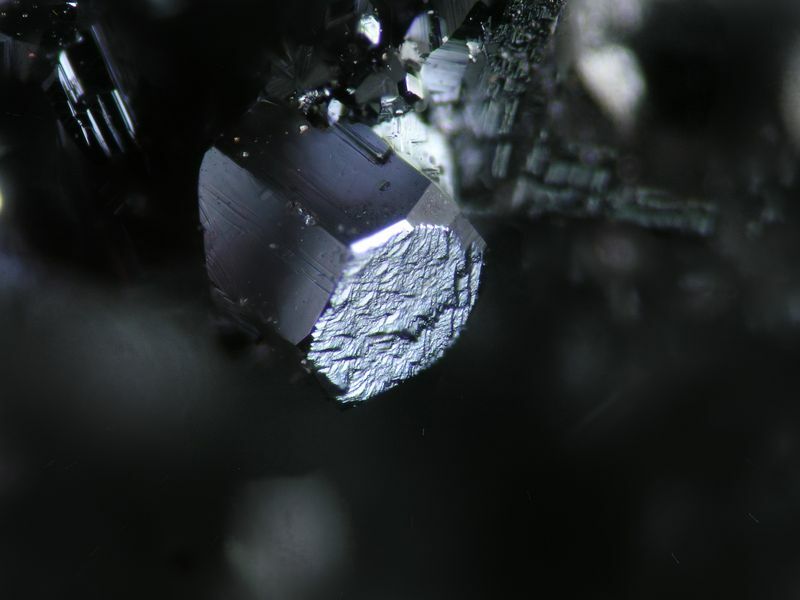 Instead, we found Pyrargyrite in the form of deep red, As-free prismatic crystals on Freibergite. 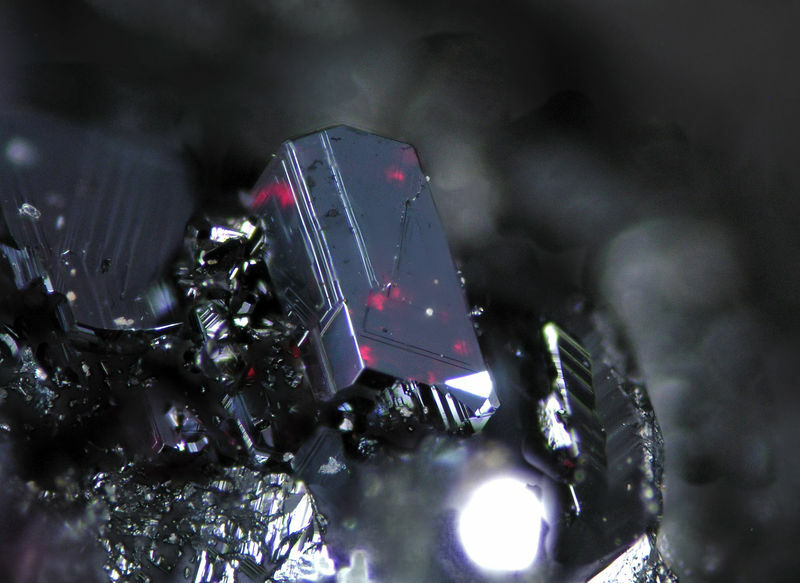 The crystals in the studied samples are millimeter-size. This mineral maybe the most interesting silver sulfosalt from a collection point of view, due to the size and quality of its crystallization. 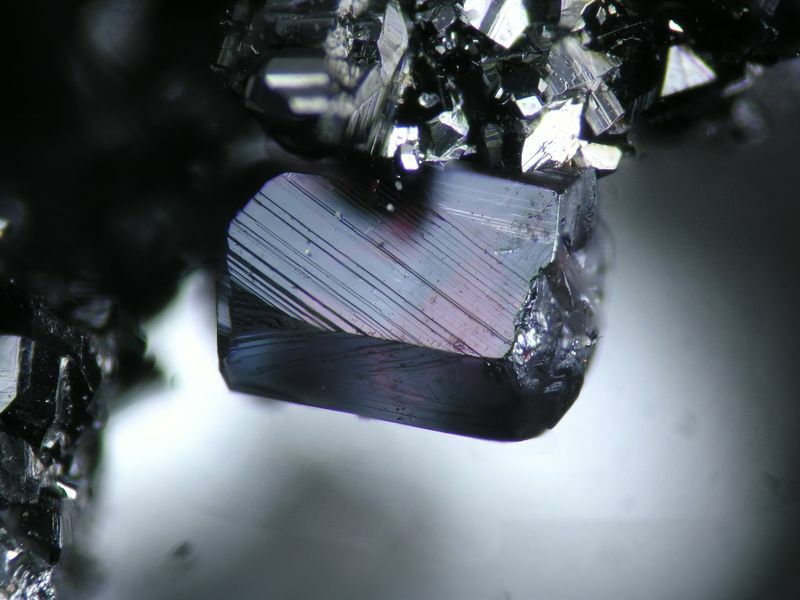 The miargyrite are found in the form of grey black metallic crystals and groups, occasionally reaching the centimeter size. As a caveat, it must be noted that every sample of miargyrite or other sulfosalts on sale from Oaxaca deposits should be analysed separately, as we observed incorrect labeling in some specimens. Often, some species appears in the same specimens and are easily misidentified. 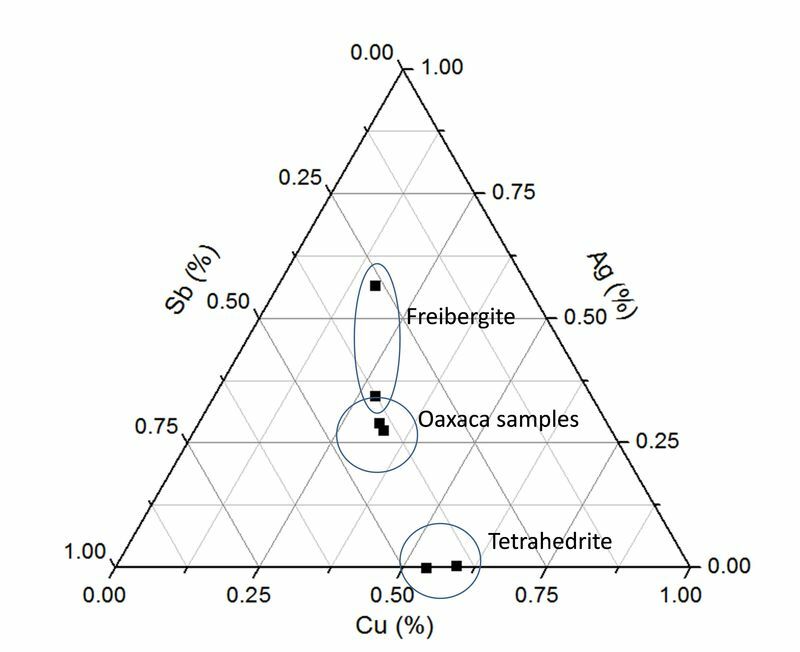 Ternary diagram of the Freibergite from Oaxaca and the lower and higher silver Freibergite I found reported in the bibliography. These wonderfully show the oscillations of hydrothermal solutions responsible for the the crystals. You talk about chemical analysis of specimens for mineral ID, do you have anything on zoning of individual xlts? Thank you for this beautiful proof. Nice work. How did you obtain the samples for your study? I ask because I saw Oaxaca miargyrites in Tucson 2014 with labels that read: San José de Gracia. Can you can help me clarify if they are really from San José del Progreso as you say? I collected this specimen two weeks ago on Level 6 in San José de Gracia, along with silver sulphosalts. I'm afraid that I am not the appropriate person to answer your question. This is why I said "according to my information". I can only guarantee the origin of the samples I collect myself... that is, very few :)). The samples belong to very reputable sources and, according to the information they provided, the samples come from San Jose mine, in the municipality of San Jose del Progreso. The mineralogical assemblage is coherent with this origin, although the mineral in San Jose de Gracia (your sample is from the El Aguila mine?) have a similar metallogeny. Take into account that my role here is only to identify and guarantee the mineral species present in the specimens, and my knowledge of the context is scarce. About the question of Bob, no, I did not studied the zoning of individual crystals. Since the samples analysed are collection specimens, I performed non destructive assays and with the minimum manipulation. I analysed several crystals in the same specimen and different points in a given crystals, showing roughly the same composition. But this should not be considered a zoning study. My sample is the Águila Mine, level 6. I will investigate this and will comment on the results.